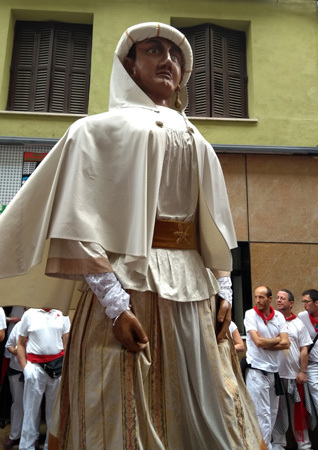 Fermín may be one of the patron saints of Navarra, but his feast day on September 25th doesn’t exactly correspond to summer festivities. And there’s little proof that he met his martyrdom being dragged around by a bull. 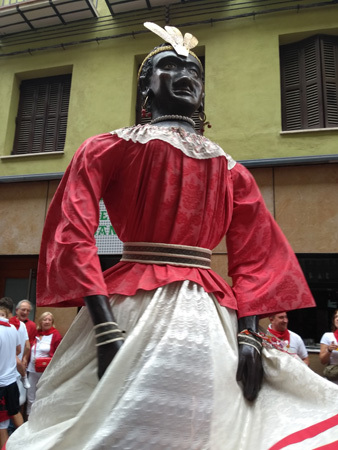 San Fermín was beheaded in the year 303, hence the red kerchief worn around the neck of all participants. Wearing any white outfit reflects the saint’s purity, & a red sash often accompanies the outfit. Around 1600, the celebration of San Fermín moved to coincide with a large market festival on July 7th… as cattle merchants brought their livestock to Pamplona. 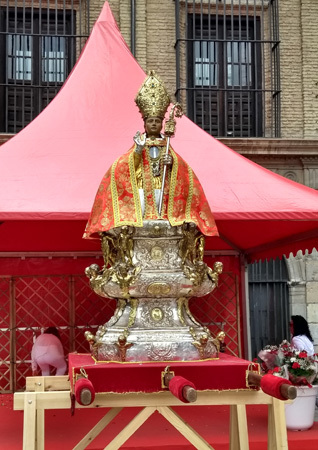 Relics of San Fermín are also brought out on this special day & a festival was born. A half-mile exists between the unloading point for six bulls & the bullring where they will fight in the afternoon. What better way to get there than run through the city? Six steers follow the bulls & can be used to get them back on track. Most streets are narrow, so it’s rare a bull would turn around mid-run but it can happen. Barricades line the entire route (hence the Spanish term for the event, encierro). What begins as an initial uphill climb weaves past the town hall, takes a sharp right turn on Calle Estafeta & then it’s a straight shot to the bullring. The run itself occurs every morning at 08:00 during the entire week. An initial firecracker lets runners waiting further ahead that the first bull has left the corral. A second firecracker sounds when the last bull has left. One thing I never realized is how fast the run can be… after all, the distance is short & bulls can run pretty fast. Normally the whole event lasts for only three minutes, but on my second trip I saw one of the shortest ever: less than two minutes! Speed, adrenaline & fear make time fly even quicker. Runners don’t have the luxury of taking a split-second to look back to see how close those horns are or even judge the distance between fellow participants. A rolled newspaper held behind the back provides that immediate sensory input… if someone or something is touching that newspaper, you’ve got to pick up the speed! Runners rarely die but injuries are common. EMT crews do a fantastic job taking care of participants. Another way to enjoy the party is to purchase a seat inside the bullring & wait for the bulls to come to you. Bands play music for waiting spectators, people start doing the wave & a “kiss cam” encourages couples to have fun. As people begin to flood inside, the bulls come immediately after. Bulls & steers are sent to holding stables while crowds cheer on. Finally a smaller animal is let loose inside the arena (with horns covered) so runners can pretend to be toreros. All in good fun, lots of people get tossed around & tipped over, but I’ve never seen a serious injury happen. Everyone watches the zip cam replay on national television to see the entire run… as well as a few seconds of international fame. Injuries & falls tend to get overanalyzed, but it’s the only way to see the run from beginning to end. 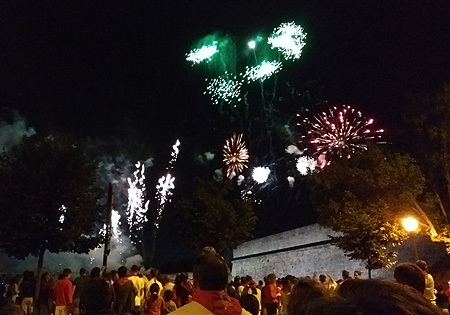 Nightly fireworks have long been a part of San Fermín, but since 2000 the show at the citadel has become an international contest. Not to be missed. 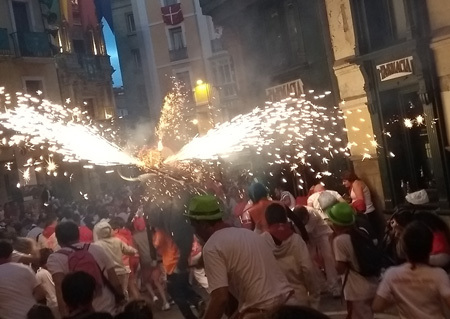 But my favorite part was seeing families enjoy the sparkler-shooting bull that runs along the route in the evening. Easy to feel like a kid! 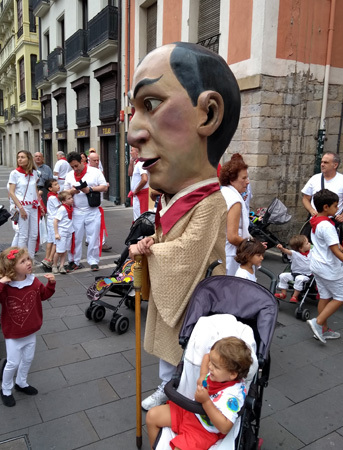 A series of extra-tall figures representing people from four different continents as well as costumed figures with oversized heads have gotten kids excited for San Fermín during the past 100 years. Most figures are for show, but smaller kilikis & zaldikos (men wearing cardboard horses) run around with pieces of foam to bonk kids over the head. Hilarious! Hemingway made the festival famous worldwide with his 1926 success The Sun Also Rises… and he apologized to Pamplona for spreading the word. Today’s version is much different with lots of concerts & copious amounts of drinking. But it can still be a lot of fun if you’re in the País Vasco in summertime. Just wear white!